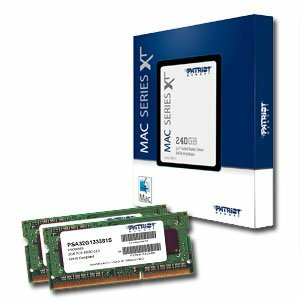 Patriot Memory, a global pioneer in high-performance memory, NAND flash, storage, and enthusiast computer products, today announces their new Mac Series XT SSDs and SODIMM lines. Optimized for the latest and popular Mac products, these premium offerings are geared for power users demanding the latest storage and memory technology to increase productivity and performance. Powered by SandForce’s® SF-2281 SSD processor and synchronous NAND, the Patriot Memory Mac Series XT SSDs offers an easy upgrade option for Macbook owners. It is capable of delivering incredible speeds of up to 520MB/s read and 500MB/s, while offering extended battery life and system responsiveness. To ensure the best performance and stability available, all versions of the Mac Series SSD are tested at the Apple® Developer Compatibility Labs for quality and reliability. Patriot Memory’s Signature Apple® DDR3 Non-ECC Unbuffered SODIMMs deliver the quality, reliability, and performance expected for today’s computer needs. Hand tested exclusively on Apple® systems, every module must pass strict standards to ensure compatibility, quality and reliability.